Medieval altar cruets were always small, their size reflecting the small quantity of wine used by the celebrant before the Reformation. They were used in pairs, one to contain water and the other wine. The letters here engraved on the top indicate which liquid was kept inside. A and V represent the Latin words for water (aqua) and wine (vinum). 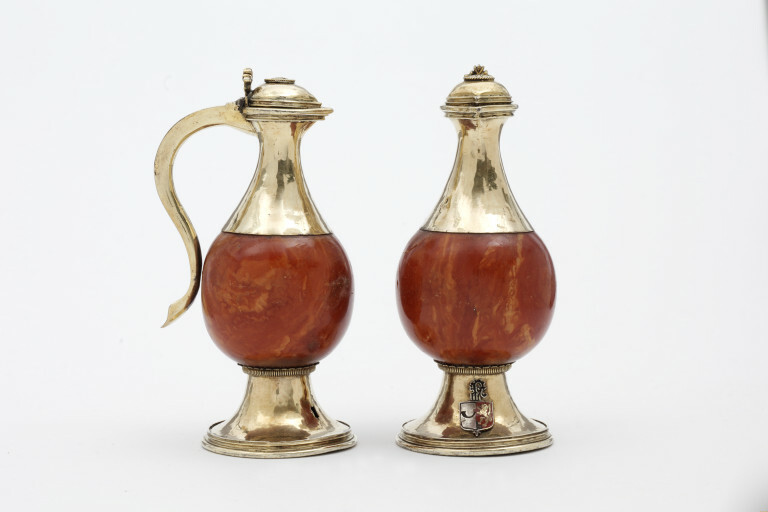 These cruets are unusual in that their bodies have been carved from amber, a valuable and luxurious material. In the fourteenth and fifteenth centuries, towns such as Bruges and Lubeck started to specialize in the carving and turning of amber. This developed from the work of rosary bead makers, who formed important guilds in these towns from 1302 and before 1360 respectively. Raw amber came from the Baltic, from where it would have been imported by the Hanseatic merchants, who had important bases in towns like Bruges and Lubeck. A letter is engraved on the top of each cruet: 'A' and 'V'. Nothing is known of the provenance of these objects. The heraldic panel surviving on one of the cruets (4260-1857) is blazoned gules, a lion rampant or, impaling argent a hunting horn proper. The crest is a crozier. As the arms are impaled, it has been suggested that they may refer to a marriage, with the wife's family name perhaps 'Horn' if the arms are canting. The crozier crest may well identify the patron as a bishop, but may simply imply that a bishop had been a member of the family. 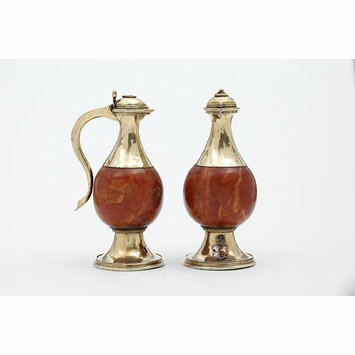 Historical significance: These cruets are a valuable survival of a type known from Netherlandish paintings. They would once have formed part of a set of liturgical metalwork used during masses. Water is mixed with wine, and both these are stored prior to being consecrated in cruets. The letters A and V indicate whether they held water (aqua) or wine (vinum). Objects of this sort might have belonged to a church or monastery, to which they could have been given by a lay person or an ecclesiastic; they could have been reserved for use in a private chapel; or they could have been the personal property of a priest. These cruets are unusual in that their bodies have been carved from amber. Amber had been a popular medium for rosaries since at least the thirteenth century, but in the fourteenth and fifteenth centuries, towns such as Bruges and Lubeck started to develop the carving and turning of other forms from amber. This work almost certainly grew out of the work done by rosary bead makers, who formed important guilds in these towns from 1302 and before 1360 respectively. The raw amber probably came from the Baltic, from where it would have been imported by the Hanseatic merchants who had important bases in both these towns. Amber mounted in silver-gilt, with coat-of-arms in champlevé enamel (missing from one). The form of these pieces is simple, but generally corresponds with Northern European goldsmiths' work of the fifteenth and sixteenth centuries. There are various dated vessels which are similar: a coconut shell vessel from the abbey of Maubuisson documented since 1463 (reproduced in the exhibition catalogue Les Fastes du Gothique, Paris, 1981) and two cruets from Lubeck in the Metropolitan Museum, New York, dated 1518. Illustrations tend to confirm such comparisons, for example the cruets shown in the painting of St Eligius by Petrus Christus of Bruges, dated 1449, in the Metropolitan Museum.